LVM disk extension can be a challenging experience for who are not familiar with unix environment. I will try to explain it as simple as possible in this guide. Heads up: You need to reboot the virtual machine twice! There is no live-extension way for LVM in vSphere environment. If you want to do it live-extension, you need to add new VMDK hard disk to the VM and extend in the LVM console. I will write about that later. This guide is based on Ubuntu 12.04 LTS. 5. Right click on your VM and click “Open Console”. Click the “Connect CDROM” button on top right and choose “Connect to ISO image on local disk”. 6. Choose your g-parted ISO file and click “OK”. 7. Now reboot your VM. You will see the BIOS screen. Go to “Boot” tab. Using UP-DOWN arrow select “CD-ROM drive” and bring it before Hard Drive using “+” sign on your keyboard. Go to Exit tab and select “Exit Saving Changes”. This will reboot your virtual machine. 9. 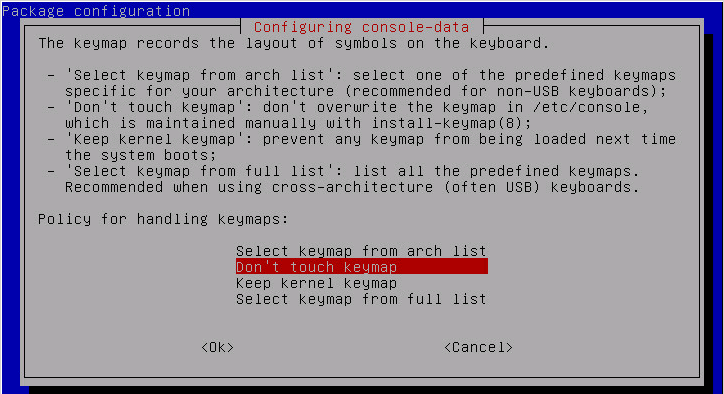 Choose “Don’t touch keymap” for Configuring console-data. 10. It will ask for language selection. Type your language number and hit Enter. Default is 33 (English). 11. Choose G-Parted mod, default is “0”. 12. G-parted will boot and Device manager screen will be shown in the screen. Now select LVM device which’s File System is “extended”. It is /dev/sda2 in this example. Click “Resize/Move” button on top. 13. You will see a new popup resize screen. 14. Extend it by using scroll on the screen or by typing here. Click Resize/Move button. On main screen “Apply” button will be activated, click it to apply the configuration. It will ask again to be sure about it. After operation is successful, click “Close”. Exit the main screen and reboot your VM. 15. Your system will be boot normally, but you need to format the new size in order to use it in the LVM. As you can see we have sda5 device for LVM volume group. 17. We need to format and add the disk to sda. Command (m for help): w The partition table has been altered! Calling ioctl() to re-read partition table. WARNING: Re-reading the partition table failed with error 16: Device or resource busy. The kernel still uses the old table. The new table will be used at the next reboot or after you run partprobe(8) or kpartx(8) Syncing disks. Reboot the server. As warning mantioned, we need to reboot the server. lvextend -l +100%FREE /dev/ubuntutemp-vg/root Extending logical volume root to 13.75 GiB Logical volume root successfully resized root@mysql:/home/ubuntu# resize2fs /dev/ubuntutemp-vg/root resize2fs 1.42 (29-Nov-2011) Filesystem at /dev/ubuntutemp-vg/root is mounted on /; on-line resizing required old_desc_blocks = 1, new_desc_blocks = 1 The filesystem on /dev/ubuntutemp-vg/root is now 3605504 blocks long. The filesystem on /dev/ubuntutemp-vg/root is now 3605504 blocks long.